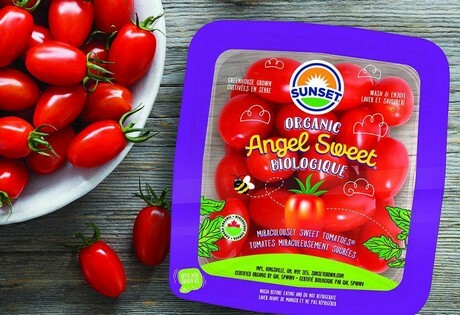 Showcased in Sunset’s new backyard-compostable packaging, organic Angel Sweet® was one of 53 products to compete in the New product Showcase, which was judged by a panel of industry leaders. Greenhouse grown and born from the world’s sweetest grape tomatoes, Organic Angel Sweet delivers the same exceptional flavor that consumers expect of Sunset snacking tomatoes. And like all Sunset products, they are Non-GMO Project Verified. “Sunset continues to be the leading driver of growth in the snacking category, and this new offering generates excitement within the growing organic segment,” says Nicole Balderas, Vice President, Marketing. This award follows in the footsteps of the product’s conventional counterpart, which has received numerous accolades, including the prestigious Superior Taste Award from the International Taste and Quality Institute.